5 Ir +a + place ¿Adónde va María? Where is Maria going? 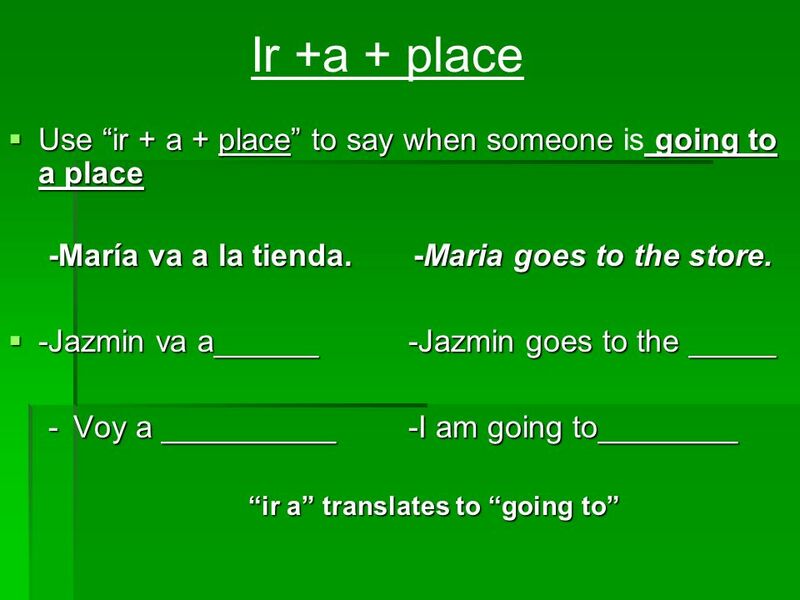 6 Ir + a + infinitive Use “ir + a + infinitive” to say what you or someone else is going to do. María va a estudiar. Maria is going to study. José va a camicar. José is going to walk. 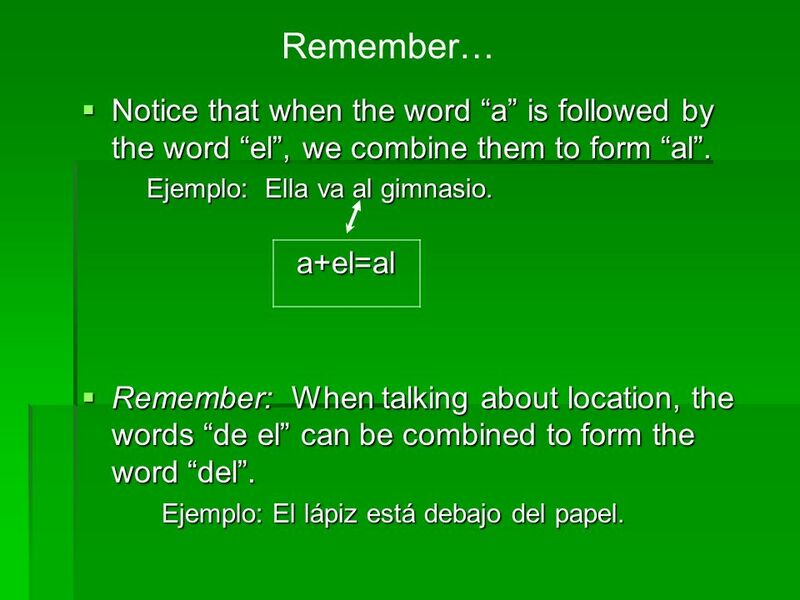 7 Remember… Notice that when the word “a” is followed by the word “el”, we combine them to form “al”. Ejemplo: Ella va al gimnasio. 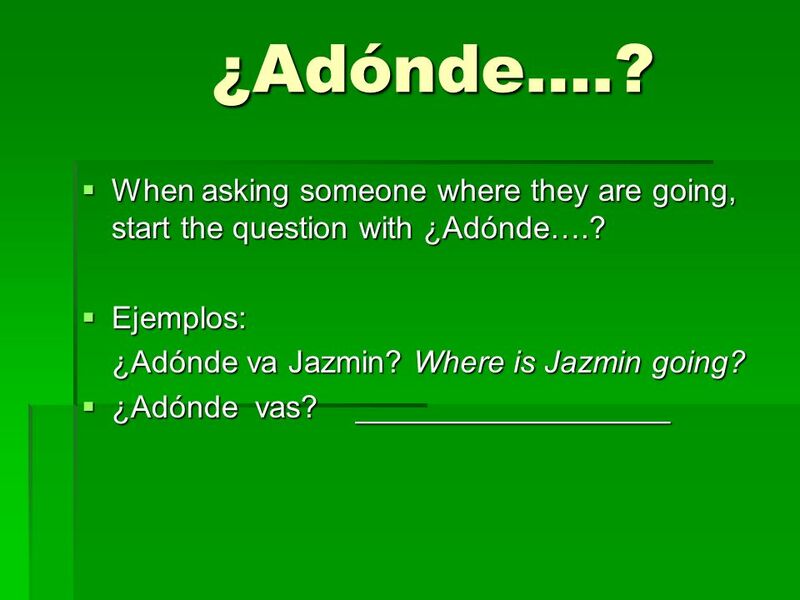 a+el=al Remember: When talking about location, the words “de el” can be combined to form the word “del”. Ejemplo: El lápiz está debajo del papel. Yo voy a la escuela todos los dias. I go to school every day. Maria y Carlos van a la clase de español. Maria and Carlos go to Spanish class. 2. To say when someone is going to do something: Yo voy a almorzar. I am going to eat lunch. Maria y Carlos van a estudiar Español. Maria and Carlos are going to study Spanish. 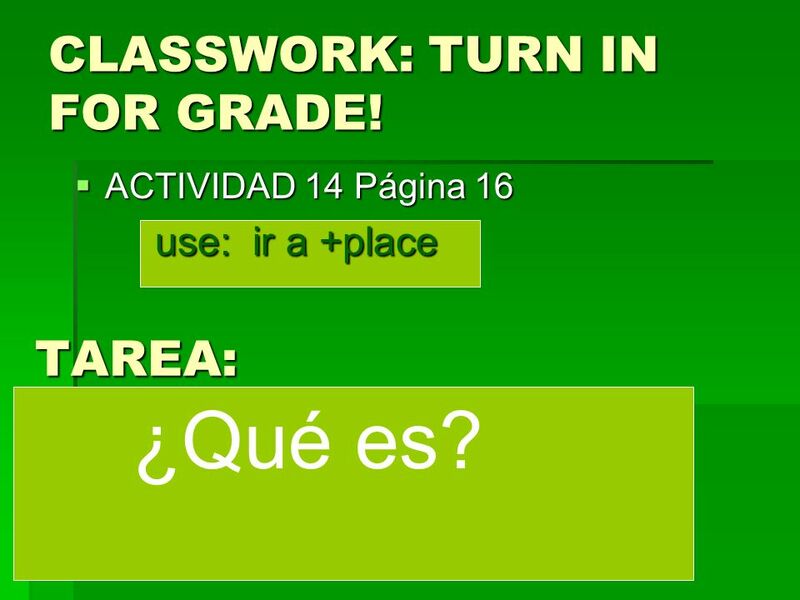 10 CLASSWORK: TURN IN FOR GRADE! ACTIVIDAD 14 Página 16 use: ir a +place TAREA: Write YOUR weekly agenda. Tu Horario de la Semana (refer to Act. 12 página 16) ¿Qué es? 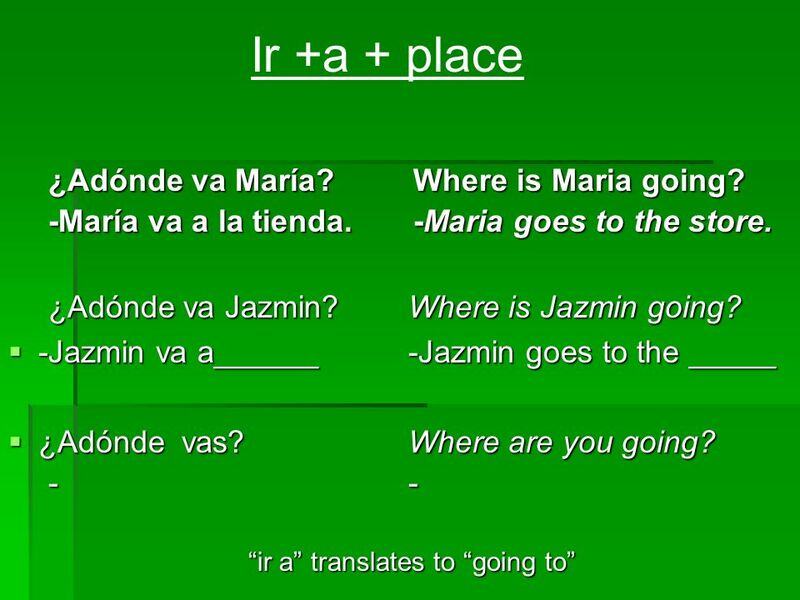 Download ppt "IR- to go voy vamos vas vais va van"
IR. Ir - Infinitive What is an infinitive? Ir = To go. How to say you are going to do something. 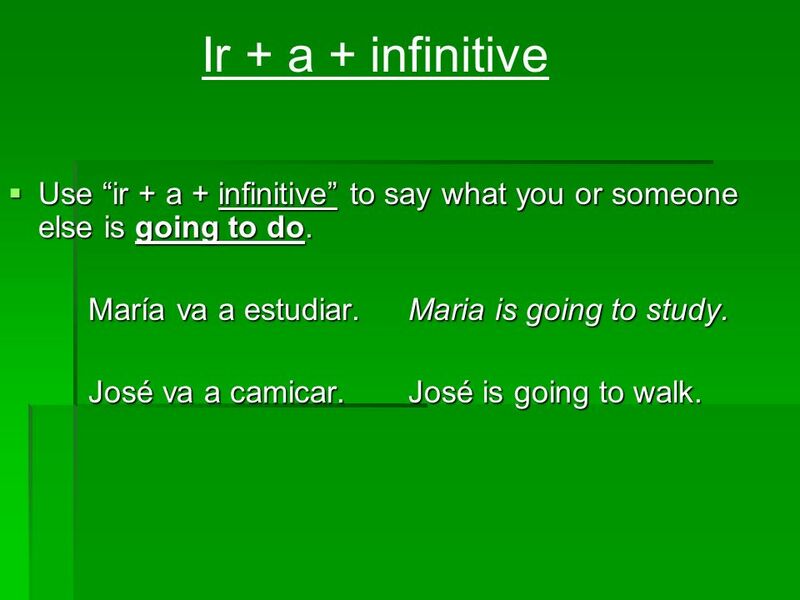 La vida escolarGramática 2 Ir a with infinitives Preview Ir a with infinitives Weekdays. 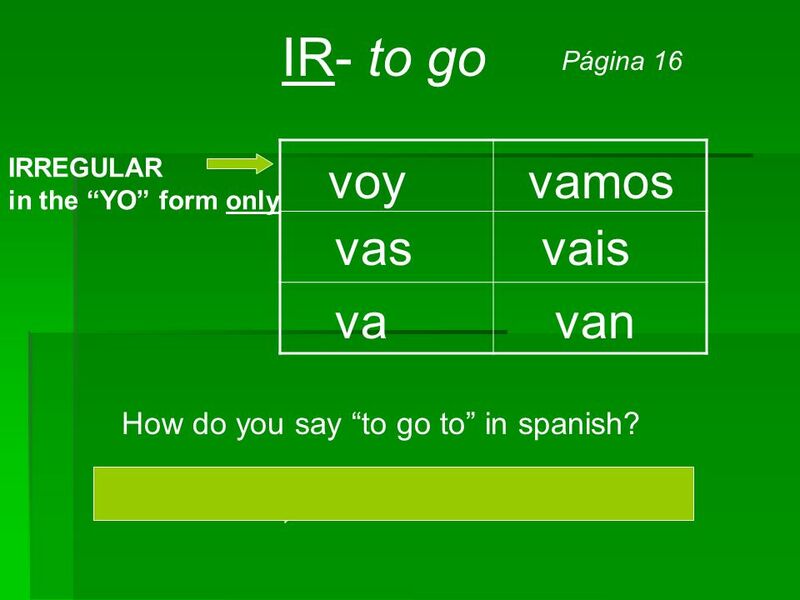 Ir - To go voy – I govamos – we go vas – you go vais – you pl. go va – he goesvan – they go she goes you f/pl. go you f. go. To come… The Verb IR. Español I El verbo IR To go. 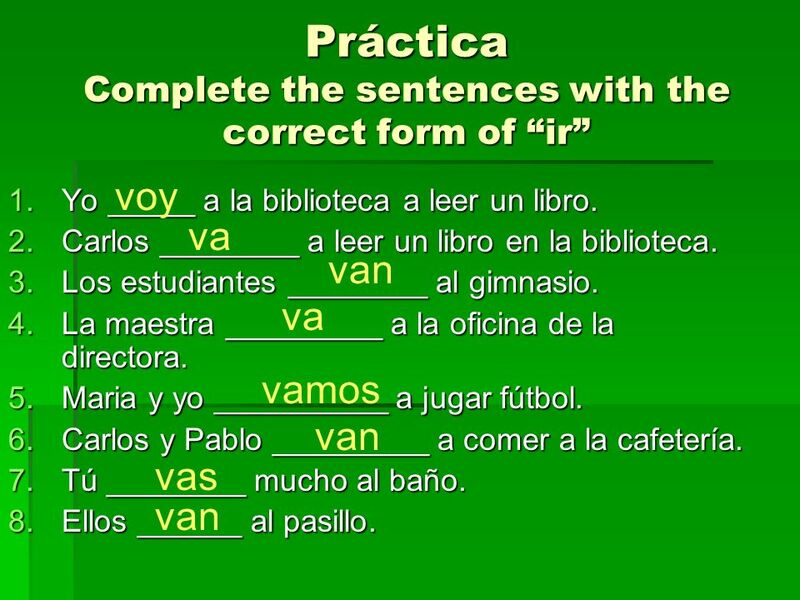 REGULAR VERBS Verbs whose INFINITIVES end in -ar follow a pattern. 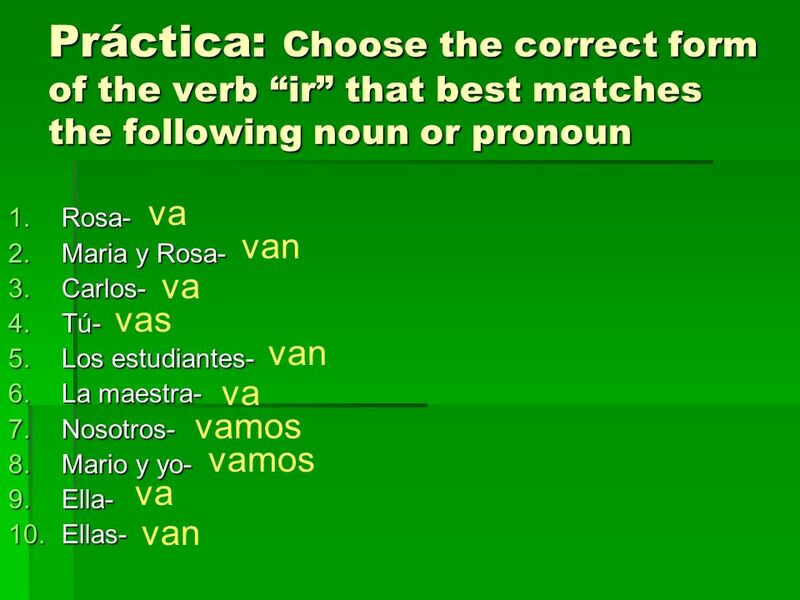 Page 43 Realidades 2 The Verb IR REGULAR VERBS Verbs whose INFINITIVES end in -ar follow a pattern. IR + A + INFINITIVE. Ir + A. 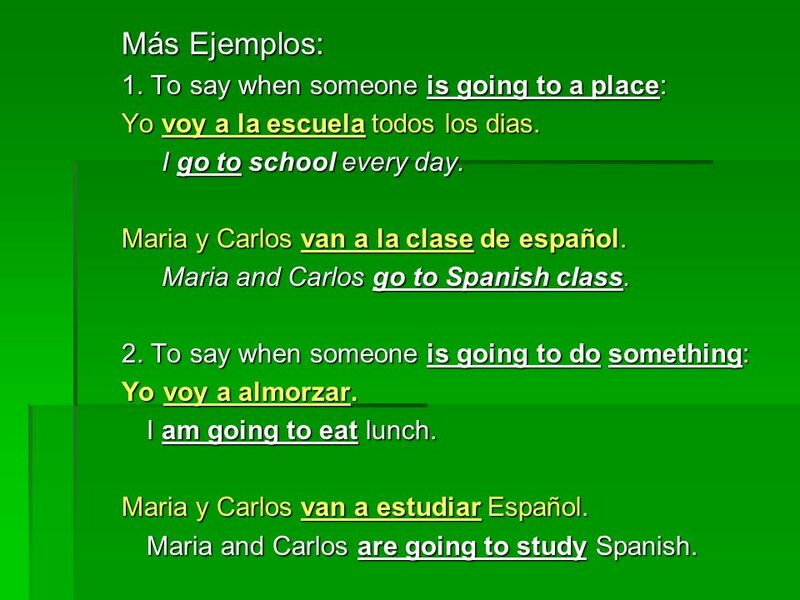 Expresses the NEAR FUTURE Going to (do something) Examples: I am going to go to the mall. He is going to go the bank. We are going to go to the. Apuntes del futuro Remember using the future tense using the formula form of ir + a + infinitive? Lets refresh! Español III Pre-AP. Grammar Review Presentation Ir + a + Infinitive.